The Democrats, realizing that Kerry is shaping up to be a real Loser against Dubya next Fall, are trying to appeal to the pacifist voters. 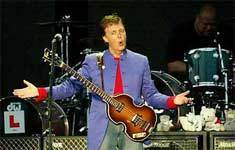 Yesterday, they announced that Paul McCartney will hold fund-raising concerts to benefit injured children in Afghanistan and Iraq. Today, they unveiled their plan to rehabilitate Saddam Hussein. Rumors are that he will be cleaning toilets on US military bases around the world. Tomorrow they are expected to reveal plans to turn Osama Bin Laden into a Peace Park lawn ornament.